Recent release “God Child” from Page Publishing author Leigha Katuin is the story of Angela Spencer, an adopted child who longs to escape from her dismal reality and spends her free time buried in books about far-off worlds she longs to visit until one fateful day, she learns the truth: her real family is waiting for her in a distant world ruled by magic. What she didn’t expect is that the world is in danger and it is up to her to save it. 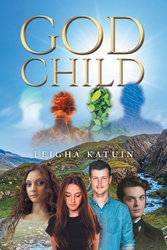 Leigha Katuin has completed her new book, “God Child,” an original and innovative story about a adolecent girl named Angela Spencer who longs to escape from her dismal reality and the adoptive family that never truly seems to accept her. Angela spends much of her time reading about far-off worlds and fantasizing about visiting them until one day she learns the truth: Her real family is waiting for her in a magical world ruled by the Four Gods. Angela travels to the mystical universe only to find that the elders – a mysterious group that has worked for generations to undermine belief in the Four Gods – are after her and that as the key to the mystical realm, she is in grave danger. It is up to her to save not only herself but the entire universe. Published by New York City-based Page Publishing, Leigha Katuin’s mesmerizing tale will captivate readers as they follow Angela Spencer into a mystical world ruled by old gods and magical creatures. In order to be reunited with her real family, Angela must save herself and ultimately, an entire universe. Readers who wish to experience this mesmerizing work can purchase “God Child” at bookstores everywhere, or online at the Apple iTunes store, Amazon, Kobo, Google Play or Barnes and Noble.